When you're investing in Digital Asset Management (DAM) software, choosing the right solution for your organisation is just the first chapter in the journey. A software provider might have a great product, but you'll only get the most out of it if they are supporting you every step of the way. At ResourceSpace, we realise that helping companies to optimise the performance of our DAM software is an ongoing responsibility - which is why we've put a lot of time and resource into developing our onboarding and support programme. Unlike many other technology providers, we don't just give you some basic instructions and leave you to work out how to use our solution on your own. From the very start, we will fully scope out your business requirements - from what type of resources you intend to upload, to what sort of information you need to capture and store about each document. From there we follow a structured introduction programme to make sure you are using our DAM software correctly, and you feel confident with its features and functions. We will also offer you best practice on how to use the ResourceSpace platform to meet your needs, and give you an opportunity to test the software before rolling it out across your business; tweaking the platform set-up if necessary to make sure it is optimised for your organisation. The beauty of DAM software is that it can be used by anyone within your organisation, to make file storage and sharing much quicker and simpler. However, how effectively the wider team utilises the software rests on the quality of their training. Our onboarding programme includes up to four initial training sessions, to take the lead contact or key administrators through the software capabilities, and how to maintain the platform for their users. This also provides a useful opportunity for people to ask questions, so they can understand how our DAM software will enhance their role. When you're introducing a new solution, there's a lot of information to take in - and sometimes people forget how certain features work when they come to try the software on their own following a training session. Around 3-4 weeks after going live with our platform, we will offer your business a complimentary health check, to make sure everything is running smoothly and answer any initial questions about the DAM software. We will follow this up every year with an annual health check, to ensure the system is evolving in line with your company requirements, and advise on any new features we've developed that may benefit your organisation. We'll also use health checks to get valuable feedback on how our system is working for your business, which enables us to keep making tangible improvements. If you're using a system day-in, day-out your company users are bound to have questions, which is why we offer all customers an ongoing support service. Our Support team are on-hand to deal with anything technical such as upgrades, fixes, and any general queries about using and configuring your ResourceSpace for getting the most out of your DAM software. 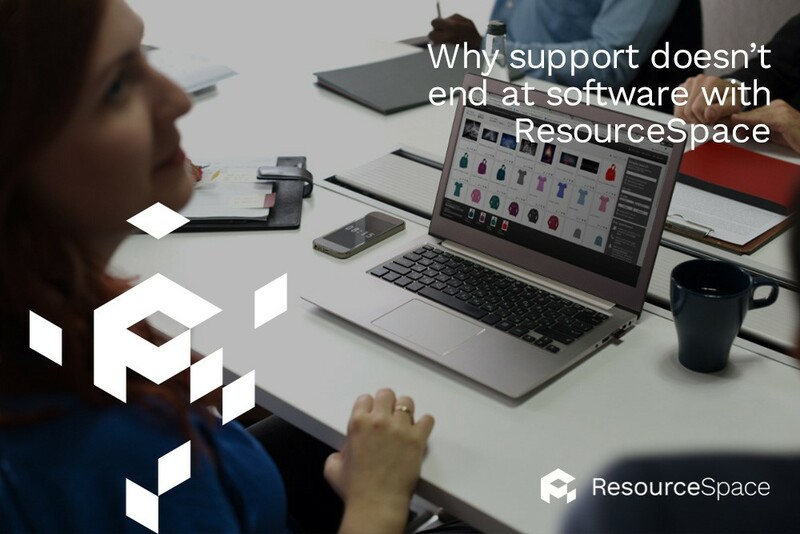 If you're ready to embrace DAM software, ResourceSpace can help you set up a solution in a way that works for the needs of your organisation. Give ResourceSpace a try for free to see how it can streamline digital file sharing and storage, or speak to our team.